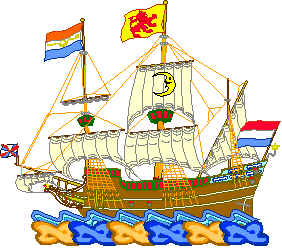 CREST: On a wreath tenne (orange) and azure (blue) the full rigged ship "Half Moon" all proper. This device is the official emblem of the National Guard of New York and is borne on the colors of each organization, surmounting their Coats of Arms. The Crest is Henry Hudson's ship "Half Moon" in which he discovered the Hudson River in 1609. The original European settlement in New York was Dutch and the twists of the wreath are orange and blue, the colors of the house of Nassau. The original drawing submitted for the crest was made from a water color sketch, photographs and description of the "Half Moon" contained in the Fourth Annual Report of the Hudson-Fulton Celebration Commission to the Legislature of the State of New York, 20 May 1910.